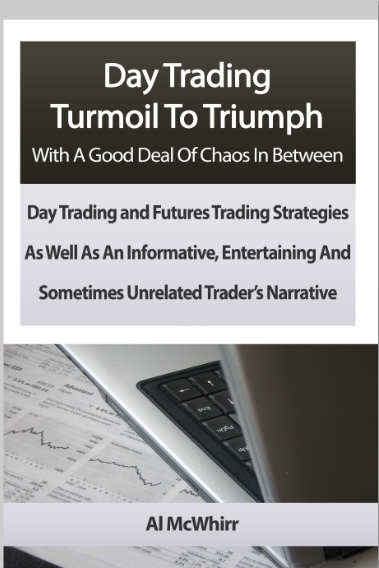 BY CLICKING ON THE COVER BELOW, YOU WILL BE TAKEN TO A PLACE WHERE YOU WILL HAVE THE OPPORTUNITY TO PURCHASE A BOOK ABOUT MY TRADING EXPERIENCES. Although my book will give some insights in regard to how I progressed as a trader, it certainly will not teach you how to trade. It is my belief that no matter how much you read, you have to trade to learn to trade. I took many courses in college and read a lot of books, but I did not learn to teach until I actually entered the classroom. My book takes a look at my experiences in my trading journey. I am not a guru in any way shape or form, I am in the learning mode all the time. Hopefully there will be some tidbit of information in my book that may assist you, the aspiring trader, in your pursuit of trading success. My initial question is why is he looking at anything else? If he knows how to trade as he claims, and he is truly reading price, then he would have known what to do. You never “bail” out of a trade. The successful trader will know the target and have stops set BEFORE entering and no outside force should come into play at all. You do not EVER enter a trade if you don’t have a target or if you don’t have your stop set. vendors, as well as those who supply the charting, are out to screw him. must have lost a boatload of money over the years.